India is as crazy about fuel efficiency as it is about Sachin Tendulkar. We want more for less. Value for money applies to everything from a toothbrush to a flight ticket. And everything must be as reliable and dependable as a Nokia and a Nokia 5110, respectively. That explains the popularity and success of the Maruti Suzuki Alto. It’s just so hard to fault, motoring journalistic nitpicking aside, that we’d almost given up. But now, we have a worthy contender in the form of the Hyundai Eon — a car that’s got enough substance to disrupt the Alto’s free run. Does it? I’d be stupid if I gave away the answer in the intro, no? My father would pick the Alto K10 over the Eon if his buying decision was based on looks. His reasons would be “It’s a Maruti, it doesn’t look like it’s trying too hard and I don’t want to show off!” And since, like him, I have a fondness for shirts, I’d pick the Alto too. It looks basic, but not old. Yes, it’s got the styling elements of an old washing machine, yet no one would ever, ever, be offended if you parked it in their driveway. It’s simple — the Alto won’t get women excited if you drive past them, but no one’s going to make faces at you for trying too hard either. Safe, in a word. The Eon, on the other hand, will appeal to people who are neutral and receptive towards all things modern. It’s got slashes and curves on every possible inch of its surface, making its Hyundai family origins loud and clear. 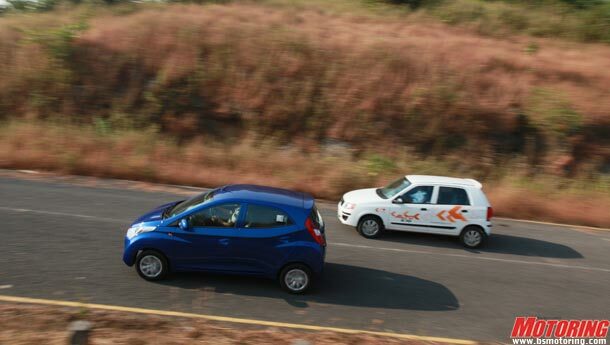 In fact, the Eon looks almost identical to the i10, only perhaps less ‘premium’. It is a pleasant looking car, very bright and cheerful, especially in that electric blue shade. The rear is particularly upbeat, with the comma-like tail-lamps and that spoiler with the integrated tail-lamp. All of that plus the tall stance of the car results in the Eon looking not only taller, but a segment larger than the Alto K10. Round one to the Eon, then. If the girl from the next cubicle asks you to drop her home, do so in the Alto. It’s so cramped, especially compared to the Eon, that it will win the ‘Most Intimate Car Interior’ award effortlessly. For anyone over 5’9’’, the Alto is a very disagreeable place to be in. Space in the rear is at a serious premium and while the Alto can fit four full-grown adults, five is asking for too much. Headroom is decent and unless you’re ten feet tall, you won’t have anything to complain about. Coming to the plastics, it’s all just a dull grey affair. The controls are standard-issue, nothing to swoon about, but they’ll last till the end of time, and that’s important. The dashboard design has remained unchanged from when the Alto was first launched, so it’s the same — functional and ergonomic, but no fireworks. Like most of its features, the Eon’s interiors too feel like they belong to a car of a higher segment. The seats in both cars have integrated head-rests, but the Eon’s seats (beige fabric, on the Sportz) are more supportive. Although here’s a negative point for the Eon — the curvature of the seat is a bit too pronounced in the higher region of the back, which means lower back support goes for a toss. And that’s quite a bother. Also, the Santro gear-knob sticks out like a sore thumb in the otherwise premium interior environment. Apart from that, the Eon’s interiors are hard to fault. The controls have a chunky feel to them and I like the two-storey recess in the dashboard — it comes in very handy. The quality and feel of plastics, thoughtful implementation of textures and the two-tone treatment to the dash are simply fantastic! However, the Eon’s big car feel can probably be a bit intimidating for beginner drivers. The A-pillars and the expanse of the dashboard are identical to larger cars unlike in the Alto, which offers you a full view of the outside whichever way you tilt your head. 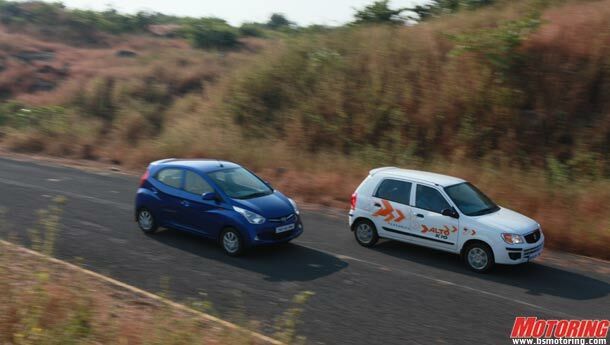 The Alto’s 998cc, three-pot motor is small, so to speak, but big on the pep factor. It loves to be revved and given its dimensions and the 67 bhp it offers, it’s a lot of fun to slot the K10 into gaps only auto rickshaws venture into. There is, however, no running away from the fact that it is a small-capacity three-cylinder motor at the end of the day, so when traffic is averaging higher than usual speeds, you have to be generous with the throttle. The gearshift on the K10 is a delight. It slots in without difficulty and is entirely stress-free (the same applies to the clutch action too). To put it in a sentence, the K10’s engine/gearbox combination suits the car’s purpose and delivers. 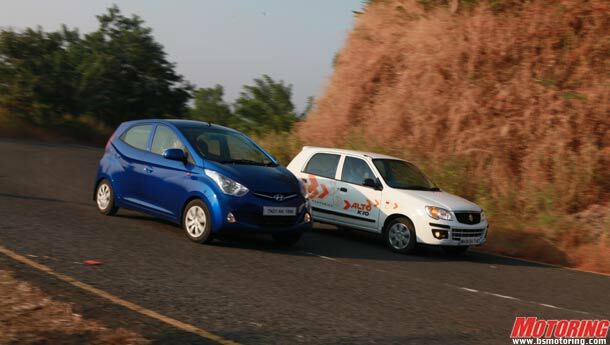 The first thing you’ll notice when you drive the Eon is the slightly gruff feel it imparts as compared to the Alto. You’ll also notice the gear-knob wobbling from idle all the way to the higher reaches of the powerband. The Eon’s 814cc, three-cylinder motor produces 55.23 bhp and 7.65 kgm@4000 rpm, healthy figures but, obviously, not on par with those of the Alto’s. 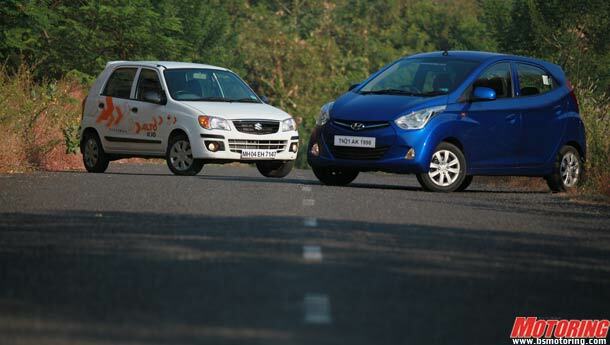 In urban driving conditions, however, the Eon’s motor feels adequately specced. Gear-shifts are smooth and the clutch too is easy on the left leg, even for extended traffic-driving stints. The K10 has the clear power/torque advantage here, and it goes about its job in an utterly refined manner. On the fun to drive front, the K10 is ace and its kart-like dimensions urge you to go faster at all times. It takes 6.41 seconds to go from 0-60 kmph while 100 kmph comes up in 15.04 seconds, leading on to its top speed of 146 kmph. At 80+ kmph, the engine sounds relaxed, having settled at just above 2500 rpm on the tacho (the Eon doesn’t get one) in 5th gear. The Eon is, contrary to its youthful exuberance on most counts, more of an easy-goer than an enthusiast’s delight. It has a strong mid-range, and even if you slot into 5th early, it pulls without feeling asthmatic. While the engine performs adequately at the lower end too, there is a glitch in the proceedings. Since fuel efficiency is indispensable to the Eon, the engine runs (or at least that’s what our cause-effect discussion suggests) lean. 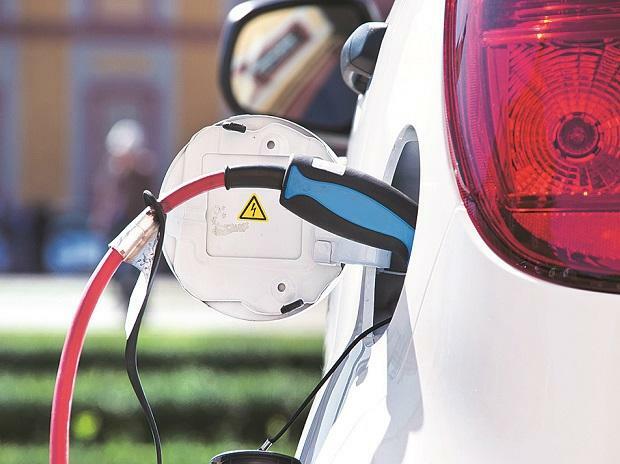 This means that in the first two gears, the Eon initially bogs down as if it’s run out of fuel, after which it pretends as if nothing has happened. Hyundai should look at a little reworking of the ECU. That should sort out the issue. It is at ease in the 80-90 kmph region, beyond which the car starts running short of oxygen. At the end of the day, the Eon emerges as a relaxed urban car sans the ‘let’s go’ (hey, wasn’t it the Alto’s tag line too?) feel of the Alto K10. I like my jeans blue and hard and you may like yours cut up and shrivelled. Which one of us is wrong? Neither, right? Yes, the Eon is an entire generation ahead of the Alto on most counts and it’s hard to imagine how Hyundai has crammed so much into a car that is cheaper than the Alto K10. But the Alto is still very appealing to people like me, who can’t be bothered to understand touch-screen phones and who like cars to be fun and communicative. These two cars are as different in character as an iPad2 and a basic Blackberry. But there’s no denying that the answer to a lot of “which car” questions to come is going to be, deservedly, the Eon.